IFA NEWS: Sony shows-off world's slimmest LCD, wireless HD TVs, 200Hz screens, flagship Blu-ray player and more | What Hi-Fi? First up was the world's slimmest LCD TV, the Bravia KDL-40ZX1. Using Sony's Edge LED technology, the 40in screen measures just 9.9mm thin at its slimmest section. Inside the breath-taking chassis you will still find the Bravia Engine 2, Motionflow 100Hz and wireless HD capability. The ZX1 uses a separate media receiver box that connects to your HD devices and then sends content wirelessly using 'Bravia 1080 Wireless' technology. The receiver also has an integrated MPEG4 AVC-HD2 tuner as well as DVB-T and DVB-C3 digital tuners and four HDMI inputs. The Bravia ZX1 should be on sale in December. Next up was the world's first 200Hz Motionflow TVs, the KDL-40Z4500. This screen sends 200 frames per second across the screen, and in so doing hopes to deliver super-smooth motion. The screen claims a dynamic contrast ratio of 80,000:1 and is also DLNA certified for home networking. The third world first was Sony's first LCD Picture Frame set with wireless HD connectivity built-in, the KDL-46EX1. This set should be in the shops by Christmas, and again uses a seperate media receiver box for wireless streaming. Bringing up the rear and still looking as striking as when we first saw it is the tiny OLED screen, the XEL-1, which is now set for launch in Europe. 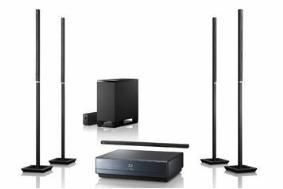 In the world of Blu-ray the BDP-S350 and the BDP-S550 are joined by the flagship BDP-S5000ES, expected to retail at around 1500 euros. It offers decoding for the latest HD audio formats including Dolby TrueHD and DTS-HD, with 7.1 channel Linear PCM output as well as Dolby TrueHD and DTS-HD bitstream audio output to external AV receivers or decoders. There's also BD-Live support and an Ethernet connection for future updates, plus a high performance 14-bit DAC. Also on the horizon is the BDV-IT1000 Blu-ray home cinema system (pictured), complete with slimline speakers to complement the on-board Blu-ray player. More information, pictures and prices to follow just as soon as we get them. Look out for more news from Sony hitting whathifi.com today.